Lauren Quigley picked up her second title with an English record in the 50m backstroke on the final night of the British Championships. Quigley, who won 200m backstroke on Sunday, touched in 27.90secs, with Georgia Davies second and Fran Halsall third. "It was a nice way to finish and I'm really pleased with how the week has gone," said the 19-year-old. Roberto Pavoni secured his third gold in the 200m individual medley. 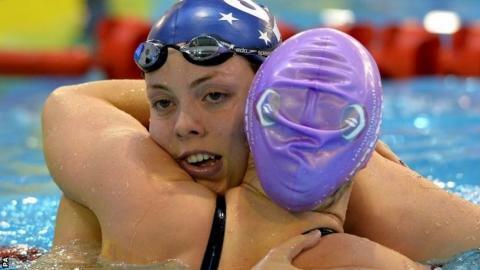 The event in Glasgow doubled up as the final opportunity for swimmers to qualify for the Commonwealth Games in Glasgow. There were further successes for Jazz Carlin (400m freestyle), Adam Brown (50m freestyle), Daniel Fogg (1500m freestyle) and Amy Marren (Paralympic 200m individual medley). Quigley has continued the forward momentum she achieved in 2013, when she qualified for the world championships in Barcelona. She believes that experience will help her in the months ahead. "I learned a lot from the world championships last year," she said. "I now know just to swim my own race when I'm out there rather than think about anyone and I've taken a lot of confidence from this meet." England's Aimee Wilmott collected her fourth medal of the championships by finishing second behind Carlin in a personal best time of 4:08:98 and team-mate Eleanor Faulkner was third. British Swimming's head coach, Bill Furniss, was pleased with the standard of competition during the championships. "There have been a lot of strong performances this week, particularly in the breaststroke events with Sophie Taylor and Michael Jamieson just two of several who have set impressive times," he said. "The key is to move it on. Our swimmers must not stand still if they want to be winning medals this summer."